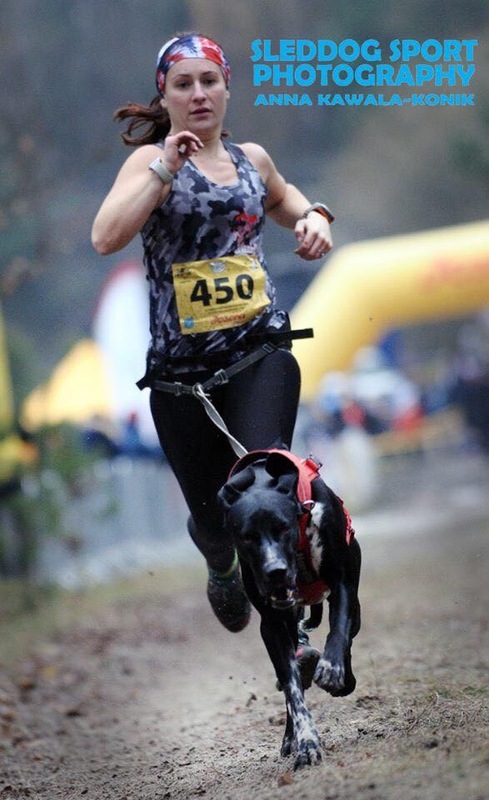 We have all read and tried the various kit out there for the sport of Canicross, dog harness, lines , belts. Typical of a nation of dog lovers we often forget how important the right type of kit for us is . Surely a pair of leggings will do the same job, you are just paying for a brand ? Trail shoes , so long as they have grip will be fine ? My jacket I use to walk the dog in rain will be fine when its raining. I am asked often what I recommend in terms of shoes , clothing , how to store phones / keys and so on . Everyone has a personal preference and of course with lots of variables. What is your budget? How often are you running? How long are you running for ? What terrain are you running over ? What is the typical conditions you run in ? Living in not only Scotland but the West Coast – Ayrshire, we run often , almost always in wet , muddy conditions. Sometimes on a good day with some side way rain thrown in to test your real love for the sport. On wet muddy trails, some slippy grass with a short mix of hard pack I found it difficult to find the right training shoe. I want enough support and cushioning that my legs don’t feel like they have been hit by hammers the next day, thanks to the pounding into the ground with the dog pulling. I also Canicross often through taking several classes a week, so cushioning is fairly important. Good grip and decent cleats to keep me stable on mud which when being pulled can make you look as stable as Gemma Collins on Dancing on Ice is a priority . Bum sliding when leading classes is not a good look for business. Then the small factor of cost – Lets be honest no hard wearing shoe is going to survive a long, healthy life whilst been battered into the ground over every terrain and drowned in thick, wet , Ayrshire mud (its a special kind of mud that eats the flesh of trail shoes) . So what warrior type sole is my choice. More Mile Cheviots check them out . Now I am not ashamed to admit this, I am late to the More Mile party. For years I was a brand snob, I thought there is no way trainers a quarter the price of my beloved Salomon and Innov8 would be any good. Having fell out of love of innov8 x talon and them ripping my heels to shreds, Salomon speedtrak due to be discontinued and doubling in price – I thought , lets give these cheap skates a go !! I am converted , I am on my 2nd pair and have bought myself their “Pace” which are not as grippy, lighter weight . I think will be the perfect “Summer” shoe. At £25 I’d say its worth a try . I have used the same size in More Miles than other brands, I have found the “Pace” are a little wider. 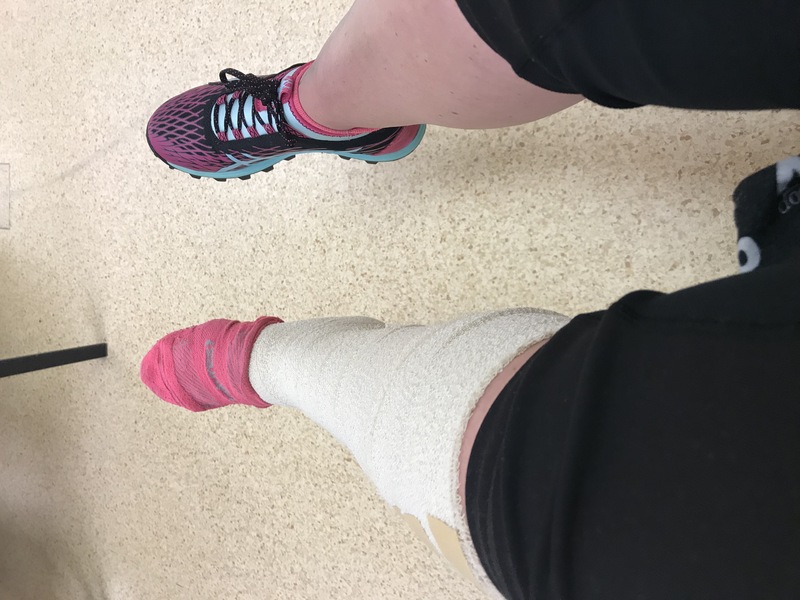 Now from someone who still has the same Nike leggings with a rip on the side since 1999, which have seen me through all sorts including pregnancy ..Does a pair of running tights make a difference ? The older I get, the longer I have trained in Canicross, the less tolerant you become of being soaked wet, muddy , and do you know what is worse than cold ..Damp!! This is where a decent pair of running tights can take my motivation from zero to hero . I am a massive fan of Skins , they are light weight , hold you in, keep you warm, the compression gives a little protection to the legs from getting battered into the ground. Most importantly they keep you dry, they don’t absorb water, if you are out all day they dry really easy, literally 10 minutes in the van with heater blasted and they are dry again. They are more expensive than standard tights but I find they last a lot longer. The downside of being a canicrosser is the belt can cause friction against the tights and bobble round where your leg straps would be . An overlay of a pair of shorts would fix that Im sure. I tend to buy my Skins from here . Something you see runners wearing and you think .. WTF! 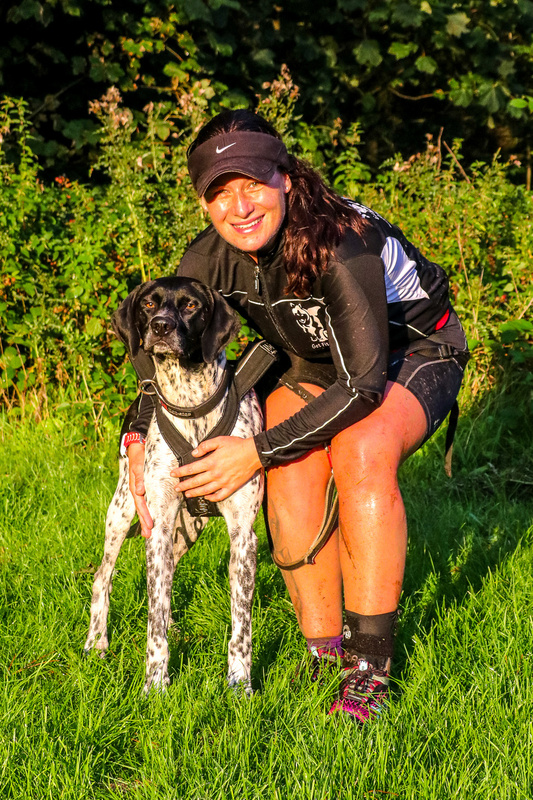 I wasn’t buying into the weird looking socks or calf sleeves , until … I started training with our biggest dog Loco , the weight and force of him pulling me and legs landing on the ground the more bruising my lower legs would feel. Running at a faster pace at start could lead to one heel kicking the opposite calf . I gave calf guards a go and have never looked back. I don’t feel I need these on every run, but certainly if I was intending to run at full speed or with a heavier / stronger dog I would pop these on to protect the lower legs . They are great to add as an extra layer under standard tights also on cold weather. At £15 if you are experiencing sore lower legs I would say this is a great buy , I have used these. There is nothing worse than the feeling of over heating inside your own waterproof jacket, which in fact is letting water in and causing you to be wetter than you would be without thanks to a mix of sweat and intruding rain water! I don’t run long distances and tend to be out no longer than 45 mins. The very odd occasion I will wear a waterproof jacket . I prefer to wear light weight tops that can zip right up. 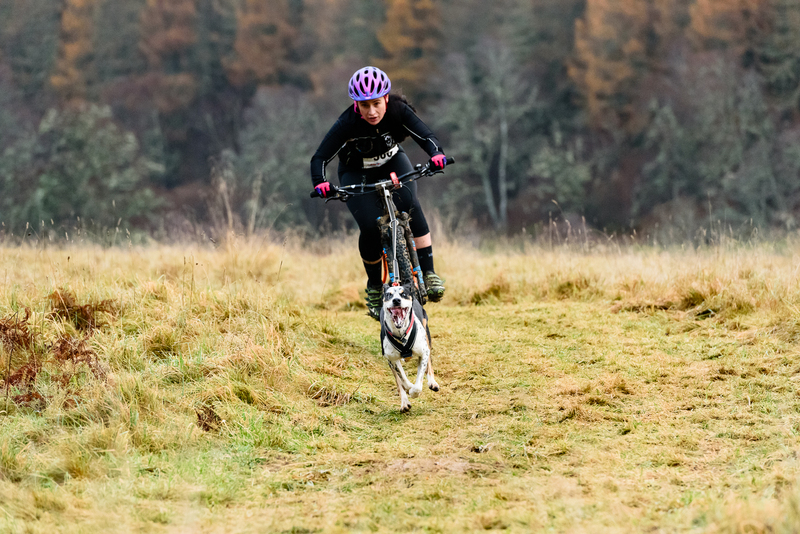 The Cani-Fit bike top is my favourite choice of top to run . 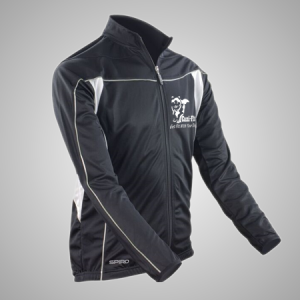 Its tight for cycling so keeps you warm, lightweight and breathable so no cooking inside the material , large zipped pocket at the back to hold keys in and stretches enough that you can layer with long sleeve tops underneath . I use these tops all the time leading classes , training at night and also race when on bike / scooter. They have lasted the mud , rain and kept in good condition for years yet. Check them out . Due to a severe ligament sprain Spring last year and not much time to let it heal and recover I am now not able to run some trails with out ankle support. Even then some slippy tree routes will test the support and set me back a few weeks in training. Hazard of the sport I guess and running as often, as long and as on technical trails as I have – I guess I am lucky to have only had this one injury . Thanks to advice from my Physiotherapist I got myself the Air cast ankle brace. He sold me on “Its the one Andy Murray uses” . From one Scottish sporting legend to an other .. . I of course gave myself months off running, then even longer off trails, rehab physio and strengthening exercises to re build before attempting to Canicross on trails again. The cast is not a quick fix or a tool to get you back out with an injured ankle. However it does protect the ankle from further damage when on the un even terrain. 9 months post injury and I now run in day light without the brace unless the trail has lots of slippy tree routes, they are the work of the devil ! Without this brace I can bet my hard earnings I would have kept injuring the ankle whilst out leading classes. It gives you great support , lightweight to run with. I do find using long socks is better than ankle socks. Again its withstood the test of the Ayrshire mud. I am now on my second brace as the bones of the first one has burst through the side. It has took a good battering. This is the little ankle saving god here . Always be mindful that Canicross will not strengthen a weakened ankle, rest , rehab and re build then protection is what you need. Don’t be a idiot, you’r dog needs you able to move on your feet.